Utility crews are working to restore power to thousands of Iowans after wind gusts of up to 100 miles an hour blew across the state early today. The scene outside Kellie Hockmuth’s house in Des Moines is a typical example of what’s playing out this afternoon in many Iowa cities and towns. 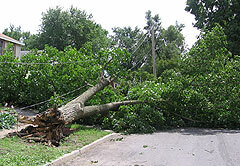 "Our neighbor had probably a 50 to 60 foot (tall) maple tree and about 75% of it fell into the (street). It pulled the power lines, pulled the power pole over, and that’s what pulled the power lines off our house," Hockmuth said. The fallen tree blocked the driveway to their home, which is located a few blocks from Terrace Hill. Hockmuth’s husband, a heart surgeon, called the hospital for a ride so he could get to work for a scheduled operation at 7 a.m. Hockmuth says she woke up at 3 a.m. to the howling winds. She says she heard a "loud, banging pop sound." Outside, the transformer was on fire. Hockmuth says the incident especially startled her child. "My three-and-a-half year old daughter woke up crying and I went in her room. All of her pictures, everything on the wall, had popped off the wall just from the force of the electrical line being pulled off the house," Hockmuth said. 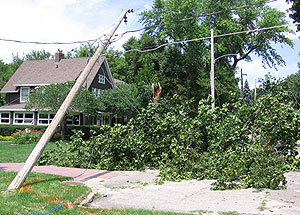 Between MidAmerican Energy and Alliant Energy, nearly 200,000 Iowans lost power. Most of those affected are customers of MidAmerican and a company spokesperson says it could take a few days to get everyone back on line. As of 3 p.m., more than 116,000 customers in the Quad Cities were still without electricity. You can check the MidAmerican website for the latest information on outages.